WeetHet - Audio - Yamakawa - How to create MP3 CD's using M.U.F.Y. How to create a MP3-CD using M.U.F.Y. ? M.U.F.Y. has been written by Norbert Igl which in first instance was intended for just converting Bitmaps for the Yamakawa. As often happens, things like this tend to grow out of the limits of it's original purpose, so now we have a tool for easy creation of MP3 CD's for the Yamakawa. Note: For the actual burning of an MP3 CDROM, read the page "How to burn my own computer (data) CDROM using Nero". M.U.F.Y. 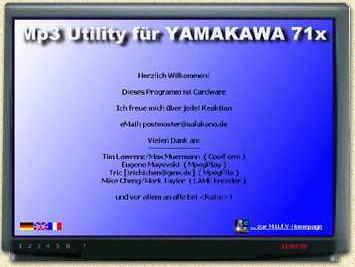 is an acroniem for MP3 Utility For Yamakawa. The current version supports multiple languages, like German, Dutch and English. You can download version 1.01 here, or just download the language module. For additional information, the latest version and other Yamakawa tools, visit the homepage or check out my Yamakawa tools page for other tools. Rename MP3 files based on MP3-ID-Tags ("Artist - Songtitle.mp3"). Support for converting "BMP" to "BIN". Rename "BIN" and "BMP" based on MP3-ID-Tags. Additional conversion of "BMP" to "JPG". Display playback time, bitrate, samplerate and encoder. Selectable font, size and color. Let's unzip the downloaded file using WinZip to a seperate directory. In this directory simply double click "MUFY.EXE" to start M.U.F.Y.. True size : the "Remote control"
In the lower right corner of the "TV" you'll find a button to open the M.U.F.Y.-homepage. In the lower left corner one can select the GUI language. The next step is to set your settings properly, using option "1" either by clicking it on the remote or on the TV. Note: A little hidden, but there is a browse button ("...") next to the directory fields. "Source MP3" - Where are the MP3's located ? "Dest. for .bin and .txt" - Where should the .BIN and the .TXT files be located ? "Dest. for ReEncoded MP3" - Where should M.U.F.Y. put the re-encoded MP3's ? "temp. Directory (for .WAV)" - Where should M.U.F.Y. put the temporary WAV files ? Do you personal settings mow. I prefer to put my MP3's and .BIN/.TXT files in the same directory. Temp files I do store in "C:\Windows\TEMP". This is just my preference, do what ever suits you. Click "OK" if all settings are done, select "OOPS" to undo changes. Sometimes an MP3 is not in the formate you want it to be. Here option 2 comes in action. More details on compression, ratios etc on MP3's you can find on the MP3 Introduction page. Note: this functionality does not offer to much advantages, so you probably will not be using it to often. Click "START" to start the re-encoding of the files that match the criteria set in options. MP3's support so called ID-Tag. These "tags" include facts like title, artist, albumname, etc. Based on this tag, M.U.F.Y. can rename MP3's to filenames of this format: "ARTIST - TITLE.MP3". This snapshot of WinAmp speaks for itself I guess. Note: the option "Change '_' and '%20%' to white space" converts each underscore ("_") and each "%20" to a normal space. Underscores are comonly used in Unix environments, while the "%20" is an Internet expression for a space. Doing so improves readability. Note: Your "Source MP3" at TV-option 1 is not properly set if the list remains empty! M.U.F.Y. is not capable of searching sub-directories ! This option, combined with option 5, displays the settings of the background image for your MP3 CD. Here you also find the "START" button which you can use to start the conversion proces. Before you do so, please make sure the settings at option 5 are correctly. Double click on the background image where no text is found. A dialog will ask you which file to use. This works the same, double click the text and a dialog will ask you font settings. For text elements you can change to location on the display by clicking the text with the right mouse button. A slight downside here: you have to enter the coordinates manually. When done editing the page layout, you can click "START" at option 4. M.U.F.Y. will generate the requered files. This option helps you generate batch files for DOS, which can save a lot of work when renaming a lot of files. Use your favorite CD-writer software to create the MP3 CD.